Rescue efforts continue in Japan following the March 11 tsunami and earthquake and the growing nuclear crisis. Thousands have been confirmed dead, tens of thousands are missing, and hundreds of thousands have been evacuated. 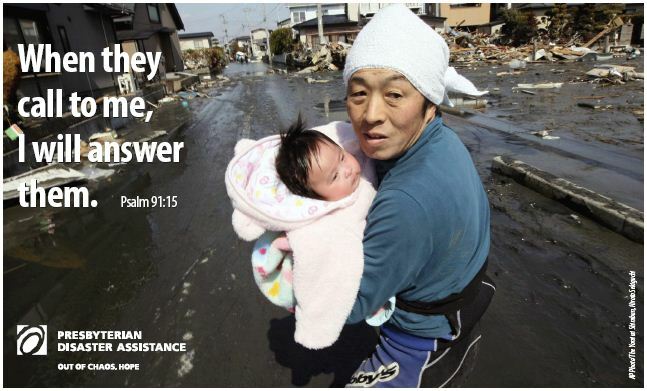 Central Presbyterian Church and the PC(U.S.A.) is responding through Presbyterian Disaster Assistance (PDA) and our ecumenical and mission partners. Ferncliff Camp and Conference Center is a focal point in the disaster assistance by assembling Hygiene and Baby Kits that are being shipped to Japan. They have asked that we help by donating the items in these kits and sending them to Ferncliff. The list of items needed and a place to donate the items can be found in McElyea Hall. The list can also be found here. Thank you for your assistance in their time of need. UPDATE: It is asked that you don’t assemble the kits before you deliver the items to the church. The campers at Ferncliff will prepare all the items into kits before delivery to disaster regions.